This ASPE Issue Brief details estimates of federal child care assistance eligibility and receipt for 2009. About 18 percent of federally-eligible children received subsidized care through CCDF or related government funding streams in an average month in fiscal year 2009. 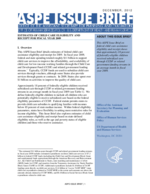 This Issue Brief also explores estimates of child care assistance eligibility and receipt based on state-defined eligibility rules, as well as the age and poverty status of eligible children and those who receive assistance.